I used to think the mutable signs had it easy, that is until this month. Let me explain. Signs are divided into three modalities or modes: Cardinal (Aries, Cancer, Libra, Capricorn), Fixed (Taurus, Leo, Scorpio, Aquarius), and Mutable (Gemini, Virgo, Sagittarius, Pisces). My favorite way to understand the mode is to think about each season. Cardinal signs begin the season, Fixed signs anchor it, and the Mutable signs shift between the old and the new. Cardinal signs are the initiators. They get things started. The Fixed signs make sure the form lasts by digging in and holding steady. These seem like big important and stressful jobs, right? The mutables are shifty, hard to pin down. 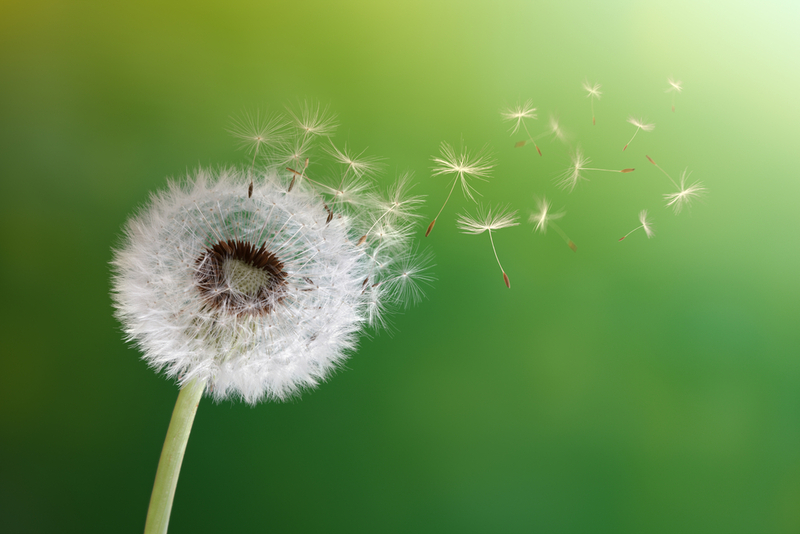 They help us let go of the past and open our senses to emerging possibility. What could be so hard about letting go and opening up? Oh my, was I wrong. This lunar cycle has been all about the mutable signs. The seed of this lunation is in Gemini. The New Moon sign influences the whole cycle and orients us to the potential of each cycle. In Gemini, this is about learning, using our air skills to connect to others, to pollinate ideas, to shake up old forms. A mutable grand cross aspect pattern has amped up the signal, putting stress on the ways we absorb, share, and interpret messages sent through the mutable airwaves. Under my old assumptions that a cardinal or fixed grand cross is much more difficult than a mutable one, I did not anticipate that this lunar cycle would be much of a test. That I seemed to be wrong about this influence tells me that mutable skills seem to be needed now more than ever. Wake up calls can be hard. Letting go and opening requires a strong container (fixed sign specialty) and a willingness to change (mutable sign specialty.) This willingness doesn’t mean it isn’t hard. Who doesn’t need a safe strong container when the world seems to be falling apart? How do we allow all the feelings around us to penetrate that strong container so we can open to change? Right now I am thinking about the hermit crab. These creatures are good at hiding, disguised as an ordinary seashell empty of its original inhabitant. Turn the shell over and a tiny crab retreats even farther into the inner spaces. Put the shell down, the crab may scurry away or go into stealth mode again, “I’m just an empty shell, nothing to see here.” Mutable signs risk coming out of their shells. In this month of Pride celebrations and the tragic massacre of queer folk in Orlando, the risk of coming out of our shells is even more poignant. The lesson of the season tells us that risking connection is vital to our evolution. The seasons are a map, an encoding, for how we evolve. Astrology captures that code in its patterns. The modes tell the pattern of threeness, so important for growth: Beginning, middle, end. Initiation, maintenance, surrender. Birth, life, death. Each mode is essential, but the mutable signs are most essential right now. Perhaps the next thing we need to learn is how to come out of the shell of protection that maintains illusion about others. Mutable signs are asking us to reach out, connect, and truly empathize. This takes an open heart, of course, but it also takes discernment. Jupiter in Virgo (mutable earth) for the last year has been schooling us on this skill. We aren’t meant to be victims or martyrs. This feels like a real opening and a new place to stand. Where will the next cycle of initiation, maintenance, and surrender take us if we can learn to inhabit this place? 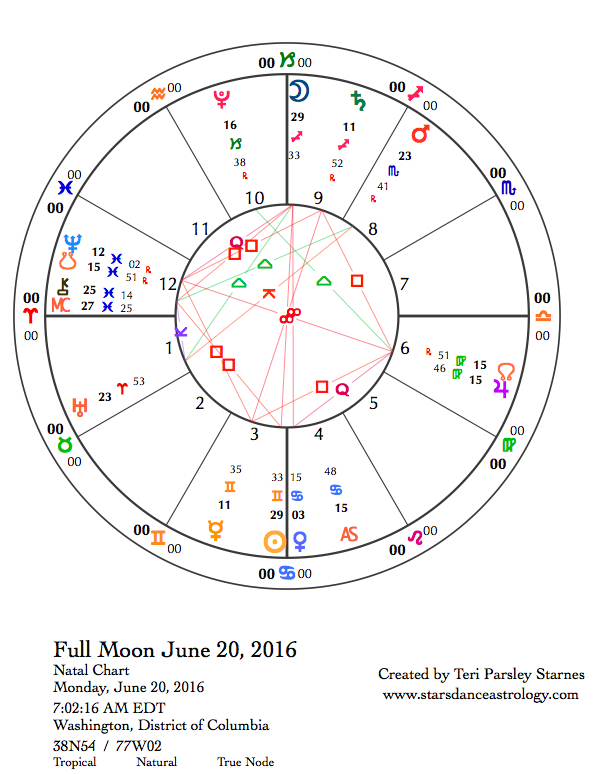 June 20—Full Moon: Illuminating. Summer Solstice. The Full Moon occurs at the last degree of Sagittarius. That means that the Sun, which is opposite the Moon is at the last degree of Gemini. Later in the day, the Sun enters Cancer, the beginning of Summer in the northern hemisphere. There is a liminal quality to this day. Liminal means the state of being between places—at a threshold. Mutable signs (Sagittarius, Gemini, Virgo, and Pisces) move us from one season to the next. This Full Moon at the very last degree is a threshold between seasons. Seasons are the patterns of life and change. We are on the threshold of change. Mutability is all over this lunar cycle. Not only was this lunar cycle seeded with Gemini New Moon potential, but a mutable grand cross aspect pattern is forcing adjustment between all the elemental styles of mutability. Major transits, like Saturn in Sagittarius square to Neptune in Pisces, have marked this lunar cycle as important to cultural and personal evolution. Jupiter in Virgo has played an important role, opposing Neptune and squaring Saturn, bringing pragmatic discernment to the equation. The square formation in the center of the chart for the Full Moon looks like an opening, a portal, leading to possibility. Thresholds are powerful places. It is easy to pass through one without a thought, but what if we paused to consider what we want in this brief moment between what has happened and what comes next? This Full Moon is such an opportunity. At the New Moon I wrote this as intention and invocation for the lunar cycle: “I want to cultivate readiness and curiosity. I desire the presence of mind to pause before reaction, to reflect before decisions, to wonder before I know. Life can change when we change our minds.” I’m not sure how much closer I am to this goal, but it still resonates as worthy of this lunar cycle poised on the cusp of change. What is your threshold? The Moon in Sagittarius points our attention to the sky. What are the big truths guiding you? What seems eternal as the world constantly shifts and changes around you? The important thing to realize may be that the external forms of truth can change. The mutable lessons of this lunation may be to recognize how truth feels, not what it looks like. I suspect there are not many of these immutable truths. Perhaps “Love is all” and “Change is constant” are the only ones. Saturn in Sagittarius is opposing Mercury in Gemini exactly. The big balancing act of this opposition is between whole truth and the infinite fractal manifestations of it. Chaotic diversity is an asset. We are on the cusp of understanding truth in new ways. Let’s think holographically: Within each part there is the whole. The opposition between Jupiter in Virgo and Neptune in Pisces has been ongoing. I’ve experienced this as the balancing act between greater empathy and greater self-care. It is imperative to find the balance here. This churning opposition moves us to the next evolutionary stage where we remember our connections and can handle the vulnerability of caring. In spite of the challenges of this grand cross, the potential for healing is great. In fact, we may be driven to new levels of healing by the heavy players (Jupiter, Saturn and Neptune) in this grand cross. If this Full Moon is a threshold for the next season, what mission will you undertake this Summer? The sign of Cancer leads the way. Refuge, hearth, nurturance, defense of family, responsibility to the young and vulnerable moves us to action. In this year of a presidential election in the U.S. it is best to not be complacent about these very important issues. Activism increases. Remember the mutable lessons of connection as you act from the heart of Cancer’s concern. Tuesday, June 21. Hefty earth energy helps to calm us. The Moon in Capricorn forms a solid trine to benefic Jupiter in Virgo. Listen to the historians and pragmatists. They have useful information. Wednesday, June 22. Mercury in Gemini stirs it up today. Mercury, as communicator and trickster, is strong here in the sign it rules. Mercury is also the multiplier. If one insight is good, why not provide a bunch of them? While we’re at it, let’s get really bored if we stick with something for too long and let’s play with those silly human assumptions about what is really going on. Mercury is square to Jupiter in Virgo and the nodes of the Moon, creating a larger possibility that the unexpected will happen. The evolutionary pathway could be muddied by too many distractions. Remember that feeling of connection and empathy. Remember we are more than the sum of our parts. Thursday, June 23. We may bristle at the experience of someone trying to control our thoughts and expression. The quincunx between Mercury in Gemini and Pluto in Capricorn does nothing to enhance harmony. Today may be the day to declare your liberation from those who may be trying to control you. The Moon in Aquarius only fuels the desire to be free. Rather than pick fights for the sake of fighting, we have the energy to look at the source of conflict and shift the pattern. Mercury in Gemini’s secret weapon is curiosity. Use it well. June 24—Disseminating Moon: Sharing. Perhaps you notice it, the mutable grand cross pattern is breaking up. That doesn’t mean we are finished with the mutable tasks of sensing and adapting, but the feeling of crisis may be abating. Our nervous systems are relaxing a bit. This shift in energy gives us the opportunity to assess what we have learned during this lunar cycle, which began on June 4. Our actions, words and even thoughts carry a bigger impact than we think. I notice that I am more aware of webs of connection. Perhaps I am learning how to put myself in another’s place. Is it possible to apply this sense of empathy to those who are very different from me? When I take that risk, what happens to the web? The Moon is in Aquarius for most of the day. An early morning square between the Moon and Mars could touch off conflict within community giving us something on which to apply all our new mutable wisdoms. Discernment balances empathy. Curiosity balances fundamentalism. Saturday, June 25. A friend with a Moon in Pisces recently told me that she had bad boundaries because she assumed that everyone she met was good. How sad that we often think that is a detrimental quality rather than something to aspire to. I told her that. What if we all went through life assuming that the other people we met were basically good? The Moon in Pisces today starts off with a trine to the Sun and Venus in Cancer. Empathy can help us see the root causes of bad behavior. Empathy doesn’t mean we cave to bullies. It just means we see where they are coming from. The Moon makes a square to Saturn and comes into conjunction with Neptune next. Another way we torture ourselves is to doubt our own basic goodness. Follow the Saturn lead and commit to living from that truth. Sunday, June 26. The Moon in Pisces is wrapping up so many of the mutable lessons of this lunar cycle. We are picking up subtle vibrations, recalling that we are connected to each other. Vulnerabilities surface when we feel exposed or when we sense another’s pain. Yet, there is joy here too. It is as if we are welcoming back long lost pieces of ourselves. The message received from Jupiter in Virgo today (opposing the Moon and trine to Pluto in Capricorn) is trust your instincts. Balance compassion with self-love. Be a pragmatic mystic. These insights come in handy since Mercury in Gemini makes a quincunx to Mars in Scorpio. Once again, a Yod aspect pattern forms with Mars as the focus. This pattern was also present when the Orlando shootings occurred. When nervous systems are stretched, people can snap. Be gentle with yourself and be aware that others may be on shaky ground. Acknowledging anger can lead to positive change. Venus in Cancer forms another quincunx aspect with Saturn in Sagittarius. This type of aspect can feel stressful without really knowing why. Take family concerns seriously.